I basically paid $35 for this lovely glass bottle. I admit the obvious: I bought this because it looked like a bottle of buried-treasure pirate wine. I knew I was being taken in by pretty packaging, but I figured that this was from Chateauneuf-de-Pape, one of France’s most heralded wine regions, so it couldn’t be THAT bad…right? I forgot that top wine regions are like luxury cars: they don’t sell with gimmicks. If you walk into a Lexus dealership, the salesman probably isn’t going to bother offering you purchase rebates or free gas for a year; his sales pitch is going to be “It’s a Lexus.” Chateauneuf-de-Pape, located in the Rhone Valley in the southeast of France, is a Lexus wine region: it doesn’t need anything other than its name on the bottle to draw people in. So when a Chateauneuf producer starts messing with the bottle itself to draw in sales, it’s probably not a good sign. Another warning sign that I totally missed: this is a non-vintage wine. Almost all still wines come from a particular vintage (2006, 2009, etc. ), which is the year that the grapes that went into making the wine were harvested. Non-vintage wines are those made with grapes from more than one year’s harvest. The only common NV wines on the market that I can think of are Champagnes and other sparkling wines, whose producers intentionally mix together base wines from different harvests when making their signature blends (called “cuvées”) so as to maintain a consistent house style or flavour “brand” year over year. Non-sparkling wines don’t do this, and flavour variation vintage over vintage isn’t considered a bad thing. Non-vintage still wines are a rarity, and those that exist are generally cheaply made and intended to be drunk shortly after release. In other words, if you buy a bottle of white or red and there isn’t a year on the label, open it right away. I didn’t do that; the Fiole du Pape has been languishing in my cellar for well over a year. It is a common wine myth that all wine improves with age, but that is entirely untrue: 95% of wines on the market (this one included) are intended to be opened within 6 months of the date they show up on store shelves, and they show best within that timeframe. The only good thing about my leaving my non-vintage, bottle-gimmick Chateauneuf-de-Pape too long is that it lets me answer a question that you might be asking right about now: how can you tell when your wine has aged too much? Wines that are past their prime taste flat, faded and lifeless, have none of the vibrant fruit flavours prevalent in younger wine and generally come across as dull and stale. My Fiole was thin in body and was mainly garnet/brick in colour (older red wines gradually turn from purple to brown as they age). The nose wasn’t very intense, but what little there was included dust, earth, coffee and dried strawberries. There wasn’t much life on the palate either: VERY low acidity (the component of wine that provides bright, zingy, tangy flavour), faded hints of dark fruit, and some metallic, coppery notes, like liquid pennies. What flavour there was faded quickly, leaving only loose tannin on the finish. In fairness, I should note that I’ve tried this wine once before and it wasn’t too bad, but in that situation the elapsed time between the Fiole being purchased and opened was probably 20 minutes. If, like me, you don’t have the willpower to resist the pirate bottle, open it immediately…as I’ve just found out, a year is too long to wait with this one. I dumped over half the bottle down the drain, and when I’m throwing away wine something’s definitely wrong. Interestingly enough, although my in-laws drink from this particular line, they don’t like this particular brand from the house of Chateauneuf-de-Pape. They actually prefer the Chateau de la Gardinier. If you’re willing to pay $45 (and that is the cheapest we have found it, at the Spy Hill Liquor Store right beside the Spy Hill Bottle Depot) I would suggest that one instead. You should do some research on NV wines; there are some excellent examples just waiting to contend with your bias. Hi Mike, I agree that there are some good examples of NV values out there – the L’Oustal Blanc Naick Rouge is a particular favourite of mine. However, I do think that the NV phenomenon is exceedingly rare in CNDP and don’t think it out of line to wonder whether a mass production NV wine from there is geared towards exploiting the luxury connotation of the region, especially when it is underwhelming in the glass. If you had a better experience with the Fiole that’s fair enough, but for close to $40 you can buy some absolutely killer wines, and for me this one didn’t come close to competing for that price. Thanks for reading! Chateauneuf-du-Pape region (not a house). I had a bottle of Pere Anselme La Fiole last night that was perfectly divine. Bright cherry fruit dry acidic with wonderful soft earthy tannins that followed on the palate. It was lovely with a rich french onion soup. This particular wine was bottled in July 2010 it is aged 1-5yrs in barrels. Non-vintage is by no means an indication of lesser quality wine but simply regulated disclosure that multiple years are blended together. The bottle was interesting, a means of market differentiation. This is the largest volume seller in the region. Perhaps your bottle was just bad. We loved ours. I think it’s fair to say that by far the bulk of quality non-sparkling wine from top world wine regions like CNDP is vintage. I understand why a volume producer like Pere Anselme would make a wine like this non-vintage (to more easily maintain a consistent house style associated with the brand), but when I’m paying $40 for a bottle of wine I’m hoping for something with a little more possible range of expression. I don’t believe my bottle was faulty (or at least I didn’t get any overt indications that it was off); I just think it was past its prime. I did mention in the post that I had previously tried a non-cellar-aged bottle that wasn’t bad, but I wouldn’t pay $40 for it either. As you say, the Fiole du Pape is a huge seller, so many people have obviously had enjoyable wine experiences drinking it, and the bottle is fantastic, but in my own opinion I believe there are so many other more interesting, more complex, more expressive bottles available at this price point that it’s hard for me to sing the Fiole’s praises. Thanks for reading! I am big fan of Rhone wines. I tend to like Northern Rhone better, but have plenty of CdP from all the big names in my cellar going back to the early 80’s. That being said, I have tried Pere Anselme La Fiole a few time and found it be nice elegant CdP. Interesting enough, I do see so many varied reviews on this wine from great to crap… They use a high quality cork and I have aged this wine for a couple of years with no issue. Thanks for getting in touch, and I’m glad your experiences have been better than mine was. I wonder if the varying results on La Fiole are due in part to the variances in storage/handling conditions that the wine experiences due to its broad distribution and presence at numerous supermarket/non-specialty shops. Even so, I would argue that consistency is of prime importance for larger production wine, particularly one from a top region at a significant price tag (as compared to its mass production peers, at least). I didn’t note any cork issues with my bottle. Thanks for reading! Oh oh, I will be trying my bottles(4) at Christmas; trouble is I have had them for at least 3 years. Will be interesting. Let me know how it goes! I’m crossing my fingers for you that I just got a bad bottle…if your bottles turn out good, I may have to do a Fiole re-tasting. Cheers! Ok, just had the first of four bottles tonight; a little flat/thin, but smooth and enjoyable. So we will see how the next 3 bottles go over the holidays. Interesting…was there any fruit left to the wine? Was the finish bitter? Thanks for the update — glad it was still drinking OK! Ok, have now finished all the bottles I had of this wine; all the bottles tasted good; one I gave as a gift, the recipient said it was a great bottle of wine! Our family drank all 4 bottles over the holidays and we all enjoyed it. No bitter aftertaste but I do think it has lost some of the fruit taste – I didn’t get much of that in my tasting. I’ve had 3 bottles of la Fiole that I recall: two red and one white. I didn’t care for either reds and so I was a bit surprised that I didn’t have to choke back the white. White CnDP is a rarity so I was curious. I wouldn’t go out and buy the white but it was pleasant. However, I’m mostly a red wine drinker because I love the stuff in the skins of grapes and I might be less critical of a white. I really liked the Senechaux CnDP: it commanded my attention right away with its sheer class and peacock’s tail finish. I’ve got quite a few others in the cellar as the QPR is still good compared to Bordeaux or Burgundy. But with press from Jeb Dunnuck and Harry Karis I expect the prices will catch up to the traditional blue chip French wine regions. Thanks for the note and the Senechaux recommendation — I’ll definitely keep my eye out for it here! My CNDP QPR winner is probably Domaine de Ferrand, which is $45ish/bottle and dynamite. Totally agree with you re: a likely price increase, especially with the string of killer vintages they’ve had in the last decade: from 2003 onward only one vintage (2008) got a WS rating below 93, which is an amazing run of consistency. Cheers! Two blogs almost word for word. Same person or plagiarism? Not sure I follow — the review you linked to bears no resemblance to mine. Mine was posted a year or so before this other one, but they’re not remotely alike. Was the link correct? Don’t know what I was thinking. Delete the post if you can. Sorry. I have just received a bottle of this as a holiday gift and am eager to try it. Will take your advice and open it as soon as possible…will share my experience! Please do, Jasmine! I just heard from someone who said their bottle was pretty good, so my fingers are crossed for you! I agree whole heartedly agree with your review of La fiole. Quite disappointing, I wish I had Googled it before buying it! This is the first time I have tried it and I wanted a good wine to accompany my Gorgonzola topped steak and it was a toss up between La fiole and one of my old faithful standby “Amorone della Valpolicell (which where I live is a bit pricier). Oh well, live and learn right? Cheers or Salute! I just actually returned from France and spent some time in Chateauneuf-du-Pâpe – and was looking online for a place to buy La Fiole when I came across this page. No doubt I had it in its prime while tasting at the Brotte Musée du Vin, but it was delicious by itself. Not something to stand next to a great vintage Chateauneuf-du-Pâpe, but very drinkable and enjoyable. I doubt I’d pay $40 for it, but the prices I’m seeing on line (in the states) are closer to $30. I might pay that, if just for the memory of my trip. For someone with a wine blog, it’s funny that you state how much you don’t know, i.e., you didn’t even realize it was non-vintage. Really? You just figured you’d cellar it for a while because it was from a particular region and you didn’t even check the date (oops! there isn’t one!)? I might as well pretend I’m a bread connoisseur and review a loaf that’s been drying for a week. In short – very lame review. Thanks for the note – I’m glad your experience with the wine was better than mine. Even at discount retailers in Canada, this bottle retails for over $35, making it an extraordinarily poor value proposition in my opinion compared to the legions of quality bottles available for less. Based on the other comments to this post, I think the bottle of Fiole that I reviewed wasn’t showing its best, but to me it remains a wine of below average quality whose price tag is only based on the regional name on the label. This remains the only bottle of non-vintage CNDP I’ve ever come across, and I got it before I started formally tracking all of the bottles I purchased and consumed. You’re right: the oversight was mine in not noticing the lack of a vintage date on the bottle. That said, one would expect that ANY bottle of CNDP could hold up for two years without completely falling apart, and this one failed that test miserably. Hope you had a good trip! What a classy response. Absolutely zero sarcasm. Will definitely be coming back to your blog! What a classy response – seriously! Will definitely be subscribing to your blog. Not sure how the double post occurred – please disregard. La Fiole originated in the 1950’s by Pére Anselme, in collaboration with glass craftsmen and ceramists the original bottle design was shaped to resemble the Rhône Valley vine plants. This wine is non vintaged because it is a blend of the best “cuvées” from different vintages. Therefore the constant high quality from one year to another explains its worldwide success: it is one of the Châteauneuf-du-Pape bottles the most sold in the World. I personally prefer vintage chateauneuf, it is very hard to beat but appreciate a fresh bottle of fiole during the holidays, great supper wine. It is slightly overpriced due to its history and overall presentation but should not disapoint in its delivery. It can be a treat to compare year to year. Thanks for the note, Simon — I appreciate the feedback and the information! Had this wine years ago and I loved its richness. Was intrigued by the bottle. Got it as a gift 5 months ago. Not as fruity and rich as I remembered and it seemed rather thin. It still is very good. I’m enjoying it. I’m glad you’re enjoying it, and definitely agree that the bottle is a work of art. i have had a bottle of the La Fiole du Pape for 8years…it was given to me as a prewedding gift..theres no date on it..so do u think it might be poison now? I don’t think it would be poison, but I also doubt it would be much fun to drink — it will have likely lost its fruit and have little left behind it. I would definitely open it ASAP, as it will not get better with age. I bought a bottle in Marseille back in the 1980’s and kept it for many years. When I finally drank it, it was an absolute delight and nothing like the descriptions of your emails. I received a bottle of La Fiole and drank it soon after, and it tasted somewhat past its prime. There are a lot of bottles of wine at that price point that give more value. The strangest thing to me was the fact that the vintner would go to all the trouble of spraying some kind of carbon/dirt mixture on the bottle to make it appear older. It got all over my hands and we had to dispense the wine wrapped with paper towels. That, along with the nonvintage status, made me think the producer was trying to put one over on the consumer. I prefer Chateau de la Gardine. It is about the same price. Although the La Fiole is very enjoyable. Sobey’s liquor store has it on sale for $29.00. It’s a good price. There is another La Fiole. It sells for about $18.00. It is very good and affordable.. While the bottle is not frosted, it is of the same shape. Agreed, Andrew – Chateau de la Gardine is way more enjoyable (and also features a cool bottle) for the same price. Much more true to the region too IMO. Cheers! by the way, La Fiole means flask. Yes, the bottle is cool and going on my wine bottle chandy that i received as a gift. I also did not notice..no vintage. Didn’t matter…I opened immediately and loved it, but my palate is not as discriminating as all of the above. $23.00 from Costco. Glad you enjoyed, Melinda – thanks for reading! 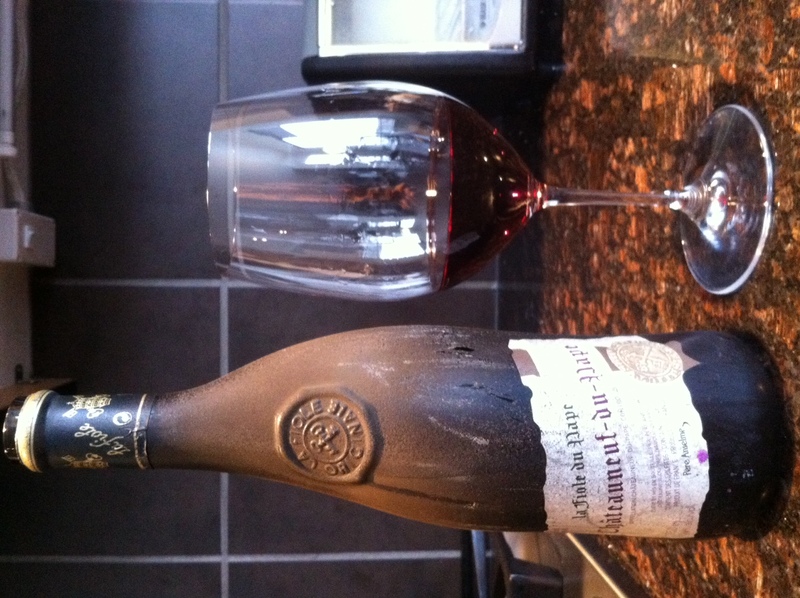 My sister have give a present two days ago: a lovely bottle of Pere Anselme “La Fiole du Pape” Chateauneuf-de-Pape. She has it from many, many years ago in her house. And she gave me for celebrate my wedding anniversary, the Vaelntine’s day. I hope, this bottle will be better than yours. We received a bottle of this 5 months ago as a wedding present and only just opened it. We were so put off by the messy bottle that it stayed on the shelf this long. I started “spring” cleaning today and this was on the list. A bit thin and flat, not real fruity. It is however very soft on the palate and not too tannic. Enjoyable but glad I didn’t have to pay for it. I enjoyed reading your blog, thanks. Hi, can’t we know at all how old is a fiole du pape bottle, because my parents gave me two bottles that were stored for more than 25 years. Some other non-vintage wines like Champagnes may have a bottling date on them, but I don’t know if the Fiole does. I am enjoying a glass of La Fiole du Pape right now. It is not a bad wine just too costly. Try La Fiole Cotes du Rhone and have the price. It is also a Pere Anselme. at half the price. Oops. Agreed that price is a big problem with the Fiole du Pape. There’s just so much better wine you can buy for $30-$40. I have a bottle or Pierre Usseglio 2006 in the wine rack. Do you know anything about this wine Peter? Sorry, I don’t; I’ve never tried it. If it’s the CNDP it should be in a great place to drink right now though! I’m in Calgary, Alberta, Canada. Thanks for all the comments on the site – certainly appreciate the feedback! Cheers! Ha ha, I’m in Edmonton!!! Lol, small world! That’s where I’m from originally. Where do you shop for wine there? The Co-op wine store. There is one in south Edmonton that is really nice. Great lay out of wine. I bought a membership for a buck. Very nice store. I have a lake cottage a Pigeon lake. I convinced my buddy at the Thorsby liquor store to bring some Les Brottiers and La Fiolle du Rhone. His prices are about $3.00 a bottle less that in town. Alas, I am the only one buying the wine!!! Heh, I grew up visiting Pigeon Lake in the summer – my aunt and uncle have a cottage at Ma-Me-O Beach. Fantastic that you’re bringing the Rhone to Thorsby!! That’s awesome. Co-op has really taken huge strides over the past couple years to step up their game in the wine department…their new stores and tasting rooms are gorgeous. I’m at the north end of Pigeon. On the Mulhurst side. Love it there in the winter. The mule deer have a highway through my lot. Last week I counted nine walking past my picture window!! !Have many great photos of them. I am retired now and enjoy the lake cottage more than ever. I am a beer drinking Albertan who discovered French red at my daughter’s wedding at the Hotel MacDonald. Enjoy a glass or two with supper. I started with Merlot and ended up with Cote du Rhone. Just love it. Chateau Neuf is definitely a favourite. La Brottier is another that I like.Rasteau, Valcyuers (okay, can’t remember the spelling but I am sure you know what I mean). Heritage is another. Any thing from Vaucluse is great. La Fiole du Pape is very pleasant and I would pick it up on sale but not at its regular price. If you ever come across anything from Saint Cosme (their Gigondas or their Cotes du Rhone “Les Deux Albion” especially), Domaine de Ferrand or Bosquet des Papes, give them a shot — all under $50 (Les Deux Albion is like $22) and stunning. For an ultra-killer deal, keep your eye out for Le Devoy from Domaine Andre Aubert — also Southern Rhone, absolutely delicious, and less than $15. I’ve written up a past vintage of it on here, but the current release is great as well: https://popandpour.ca/2012/07/23/wine-review-2010-domaines-andre-aubert-le-devoy/. Picked up a bottle of Le Devoy today. Yep under $13.00 2011 vintage. Looking forward to trying it yet with some Trepidation after reading you review. Question, why can’t I sign up to your free newsletter? Awesome!! Let me know what you think of it. No radiation poisoning – I promise. I don’t have a newsletter…do you mean subscribe to the blog? If so, I know it’s worked for others recently — could be a temporary WordPress glitch. If it doesn’t work tomorrow let me know and I’ll follow up. I am enjoying a glass of Le Devoy. And no My eyes aren’t glowing in the dark. For the price it is a great deal. Pleasant wine but I would call it “light.” Not much body to it yet very tasty. I still prefer La Fiole du Cote du Rhone, although I would definitely buy it again. I like it Peter. You beat the price! Phew! I agree the Le Devoy isn’t a world-beater and more in the medium-bodied, red-fruit camp, but I’ve always really enjoyed every bottle I’ve opened. And when your price neighbours are Barefoot and Yellow Tail, that’s a home run! Cheers Andrew! P.S. If fuller Cotes du Rhone is more your thing, check out the Halos de Jupiter CdR I reviewed earlier this month. Polar opposite in style from Le Devoy, massive and high alcohol, but excellent. Beat you to it on the Jupiter. Great wine. The just came out with another. Don’t know what it is. I will need to try it. Oh nice. I’d like to try Cambie’s Jupiter CNDP, Adrastee, at some point – he does things with Grenache I’ve never come across before. I’ll definitely grab any others I can find. I do like the La Devoy however. Being so light it goes down like a light beer. Not good this. Much more alcohol than light beer!!! can’t beat the price that is. Peter, what do you think of Belleruche? It’s a Chapoutier like La Bernardine a Chateau Neuf. Never had it, unfortunately, but I’m a big Chapoutier fan. His Bila-Haut side project in the Languedoc (southern France) is stellar value — the Occultum Lapidem from that label is amazing. Have you had the Belleruche? Recommend? Yes I have. Very nice and affordable. I also love the Bila Haut. I think that you would like the Belleruche. Full bodied wine. Great with stinky cheese, ha ha. Checked out the Jupiters today. They have two new ones on the shelf. One is a Rasteau and the other a G something. Quite pricey. I actually bought a bottle of Les Halo one time which had gone terrible bad. I opened the bottle and this terrible musky smell came out. I had this wine before and it was quite good. I poured out the last bottle I bought and haven’t gone back. Yikes. If a wine is faulted like that you should be able to re-cork it and take it back to the store for a refund…they can send it back to the agent. I’d like to try the Halos Rasteau — from a very similar area as the CdR. I’ll keep an eye out for the Belleruche! Thanks! Went to Wine and beyond and froze. Just kidding. Picked up a couple of bottles. One is Cotes du Rhone Village from Chateau de la Gardine. Bottle is the same shape as the CNDP yet half the price. The other a bit pricey, Famille Perrin Gigondas. Do you know anything about these? I haven’t had either bottle, but I have had the Ch de la Gardine CNDP and it’s great for the price, super delicious. Anything the Perrins do is likely to be good — they own Chateau Beaucastel, one of the landmark CNDP houses. I bet you both bottles will be solid. By the way. I am having a glass of Belleruche right now. I think that you would like it. It is so smooth. Prices are crazy. I bought my bottle at the Do-0p for about $22.00 and saw it today at wine and beyond for about $65.00!!! Popped the cork on Cotes du Rhone Viillages, du Chateau de la Gardine with supper. Man this one is a killer. It is not CNDP but it is just delicious. It is also about half the price of their Chateau Neuf du Papes. Opened a 2011 bottle of Le Devoy tonight. Yikes musty musty!!! Starting to develop a complex. Two bottles in two weeks. I was tempted to pour it out but, according to your advice, I re-corked it and will take it back. Good call. Definitely not supposed to taste like that. I’ve had a half dozen bottles of Devoy 11 over the last year and a half and never had one be musty like that. Bad luck! Popped open the Famille Perrin after the Le Devoy was undrinkable. It’s a Gigondas. At $37.00 it isn’t worth it. The Cotes du Rhone Village from la Gardine is much better at $10.00 less. Also a neat bottle. Hey Andrew, new one for you: Chateau Pesquie Quintessence 2011 from Ventoux in the Southern Rhone. Big like the Halos (15.5%) but delicious and with tons of structure – could probably go another decade if you wanted. I got it on sale but I think it’s $30 or so regular. Thanks Peter. Will try to find it. By the way. La Fiole, not the La Fiole du Papes is making a hit in Thorsby. I think the old retirees there like the shape of the bottle. Ha ha. Lol, as long as they’re happy that’s all that matters! LoL is right. The Thorsby liquor store is old. Not much selection. My brown friend who owns it doesn’t even drink. I have been trying to help him out by suggesting simple things like signs for new products. His prices are great. He sells La Fiole for about $16.00 which is at least two bucks cheaper than here in Edmonton. I am also trying to convince him to have a wine month. Sell the French for about a buck off. He should also advertise in the Thorsby Target, a local pamphlet which is given out free. Nothing. He doesn’t seem interested. He now has competition in town. Another liquor store opened up along the highway to the lake. Much better location. I feel sorry for the guy. His store is on main street. He really needs to set himself apart. I am slowly introducing French to his store. First came Les Brottiers which he sells for about $15.00. Now the La Fiole. Next time I’m there I will recommend Cotes du Rhone Village, la Gardine domaine. A very good wine in a great bottle. He will have to charge more for it so I don’t know if he will go along. Seeing as the good folks in Thorsby like their bottle shapes, perhaps it may sell. The poor sob drives in from Edmonton everyday. Dom Janasse is an excellent producer, one of the best in the region. I haven’t had the 06 but have had a couple others from them, one a 04 Vielles Vignes CNDP which was dynamite. I’m sure yours would drink great now but would also last for at least another decade if you wanted. It’s probably vinegar by now. The kid at the store is crazy. It’s awesome. Let me know what you think. Also, Superstore is now carrying the Halos de Jupiter CdR – $17-18!!! Good luck on your surgery! New little shop opened up in Riverbend. I went there to check it out and found a very poor selection of Cotes du Rhone. I left him with a list. I went back today, two weeks later and was stunned by the fact that he had brought in all the wine I recommended. In addition, his prices are $3.00 to $4.00 cheaper than what you can get at the Co-op or Wine and beyond. And the latter two benefit from economies of scale!!! Moral of the story, check out your local strip mall store. Give them a list of your favourites. You just might be pleasantly surprised. That’s awesome!! Great story – I would have never thought to do that. I bet some of those guys appreciate the assistance (and people taking an interest). Oh yes, felt compelled to buy a couple of bottles of Cote du Rhone Village. This is truly a good wine under $30.00. Will have to wait until after my next eye surgery on Monday to try it. Let’s go back to the purpose of this blog. My brown little friend brought in La Fiole du Pape. This is no way is meant to cast anything against the man. He is very nice. My kids went to school with brown people who wore this title as a badge of honour. Anyway, La Fiole du Pape. He is selling it for $40.00. $7.00 less than Co-0p and $8.00 less than Wine and Beyond. I never meant to have him order this bottle. I meant the vintage Cotes du Rhone La Fiole. Vintage wine, same bottle shape, less the crud and selling for less than $20.00. I am going to pop over there tomorrow with a bottle, empty, so he can see what it looks like. 40 bucks for a bottle of La Fiole du Pape is not bad. Yet it is still not worth it. Cotes du Rhone Village is now my house red. Picked up a bottle of Gerard Bertrand, Grand Terroir 2010, Montpeyroux today. Very pleasant but overpriced. A new guy opened up a liquor store in the neighbourhood so he is offering 20% off for a limited time. It’s a steal at this price. Have you ever tried it? No I haven’t – how much does it usually sell for? I’ll keep my eye out. Opened my bottle of Quintessence tonight to celebrate the successful cataract surgery on both eyes. I am not sure what to make of it. It’s a good wine but there is something there that just does not agree with me. I guess that I am just an old Cotes du Rhone wino!!! I know that I could acquire a taste for Quintessence. The second glass will probably taste much better. Ha ha!!! Congrats on the successful surgery! Sorry the Quintessence didn’t quite do it for you. For me it seemed quite similar to the Halos de Jupiter but with a bit more savoriness/ageworthiness thanks to the higher Syrah component. Hopefully it improves as the bottle empties! The surgery must have affected my taste buds. The Quitessance is just divine tonight. I just don’t understand how that works. It is a fine wine. Funny it didn’t taste that way yesterday the day after my eye surgery. Phew! I was worried I was wasting your money! I think I figured it out. It all depends upon how long you let the wine breathe. I left the Quintessance open for an hour the first night. Another hour the second night. That is when it tasted just divine. How long to you suggest that I leave the bottle opened? I’m probably the wrong person to ask because I tend to be less inclined than most to let wines breathe. That said, I would think that a wine like that wouldn’t need more than an hour, two at most. My palate tends to prefer most wines fresh from the bottle with the exception of those that are super tight at first. Out at Pigeon lake yesterday I popped into the tiny liquor store in Mulhurst Bay. Purchased a CNDP, Louis Bernard, 2011 for just a bit over $32.00. Thought it was a good deal. Do you anything about this wine Peter? Opened the Louis Bernard CNDP that I picked up in Mulhurst. Wonderful and at a very good price. I was wrong the last time. It was $31.00. Will pick up a couple of more bottles next time I’m out at the cottage. You should try it Peter. It will not disappoint. I’ll keep my eye out for it! Happy Easter!! Happy Easter to you as well!!! Hope the Easter Bunny brings you some wonderful Chateau Neuf!!! Way off topic Peter. I tired an Innes and Gunn Smokin’ Gunn. Aged for 78 days “in bourbon barrels and finished with Maple syrup.” Wowzers. Each 330ml bottle comes in a card board box. Pour in high into a brandy glass and enjoy it. I’m sold. Okay, it is a beer. I love Innis and Gunn!! I’ve never had that one though – sounds unbelievable (I love bourbon too). Thanks for the tip! Picked up a 2005 Domaine de la Janasse Cotes du Rhone Village for just over $20.00. I have a CNDP de la Janasse 2006. Have you ever heard or the tried the non CNDP wine? Opened the bottle of 2005 Domaine de la Janasse Cotes du Rhone Village tonight. Wonderful!!! Well worth the price. I suspect its age made it so smooth. Will go to Wine and Beyond to pick up a couple of more bottles tomorrow. Let me know what you think. Hey Andrew, I’ve never had the Janasse CdR but have always enjoyed their CNDP – fantastic producer. Glad to hear the 05 CdRV is holding up well – pretty rare for a CdR to have a decade long shelf life! I finished my bottle of de la Janesse tonight. Best under $30.00 bottle of wine that I have purchased. Vintage 2005. Noticed something from the bottom of the bottle. Crud, purple crud. Is this normal. Nevertheless the wine is wonderful. Totally normal – it’s just (harmless) sediment from compounds in the wine that precipitate out with bottle age, like tartrates, tannin, colour pigments, etc. It’s the main reason why you would decant older wines: not to let them “breathe”, but to separate them from their sediment. Not a fault, but a natural consequence of age. Cheers! I just opened a bottle of 1980 Niepoort Vintage Port (a birth year wine for me that was a bday gift) – you should have seen the sediment on that!! It was like a shag carpet in the bottom of the bottle. Had to pour the wine through cheesecloth to make it drinkable. Ha ha, try they la Janasse Peter. 2005 is wonderful. Wine and beyond have many others.. Prices vary way up to $70.00 depending upon the year. I’ll take 2005 anytime!!! I think someone is trying to hijack your site. it’s really annoying getting this crap on my BB. Yeah, spam bots swooping in. I delete as quickly as I can, but that’s a bad part about WordPress. Good luck. Can’t believe how quickly this came on. Happy Victoria’s Day! How do send you an attachment of Dieter the deer. Frequent visitor to my yard at the lake. You too! You can always send me any deer pics via email – petervetsch at gmail dot com. Cheers! Let’s get back to wine Peter. The other stuff was just an ambush to you successful blog. Enjoyed my Domaine de la Janasse 2005 tonight. The heel of the bottle had a lot of sludge. I suppose that this is normal? Yes, certainly normal for a bottle that old to throw some sediment like that. Part of the reason why older reds are lighter colored is that some of their pigment precipitates out via sediment. It’s been quiet these days. I’m not getting e-mails of all sorts for promotions. Perhaps they have left you alone. Picked up a bottle of Les Gardettes, Chateau de Montfaucon, 2009. It was a very pleasant surprise. Very light wine perfect for sipping on the deck during summer. Young wine at an affordable price. Just don’t make the mistake to drink it with barbecue chicken wings!!! I have had the Coudolet – it’s awesome. It’s the little brother of the iconic CNDP Chateau de Beaucastel, which is pricy ($85-$90) but worth the splurge if you ever get the chance to grab it for a special occasion. If you search this site I did a write up of a vertical Beaucastel tasting (many vintages of the same wine), which was unreal. The Perrins make some amazing juice! Peter I picked up a bottle of Les Sinards, CNDP. It’s a Famille Perrin. The bottle does not have the usual CNDP crest on it. It’s 2010. Have you tried it? No, but it got 93 points in Wine Spectator, and the tasting notes sound delicious!! Supposed to be able to last for another decade plus too. Let me know what you think when you open it! Hi Peter, Getting really annoyed by the individuals who have hijacked your site. I keep getting e-mails from them. Tried something new tonight. About $20.00.Tardieu Laurent, 2006. Cote du Rhone. Quite pleasant at an affordable price. Hare you tried it? Big bottle. Wonder what the do with these when we take them back. Wonder if they send them back to France? They email you personally? Seriously? Wow, sorry about that – it’s been and recently because I haven’t had time to post new content. I’ll get on it when I can. I’ve had T-L wines before and they’re excellent: they’re negociants who have access to some of the Rhone’s top vineyards. Is the 06 CdR still holding up OK after 8 years? Yep. Really good wine for the price. I like trying something new once in a while. This is good wine. It was $21.00 plus the usual. I was really pleasantly surprise. Yep your hijackers are sending me e-mails although I cancelled notifications from your site. Ha ha. No such thing as cancellation. Take care buddy. I have been drinking this wine for some 20 years and I love it its an enjoyable wine consistent for the table. Unsubscribed. I was getting too much crap on a daily basis. Bepi Casoriol at the G&M Gave Plan Dieu a good rating. 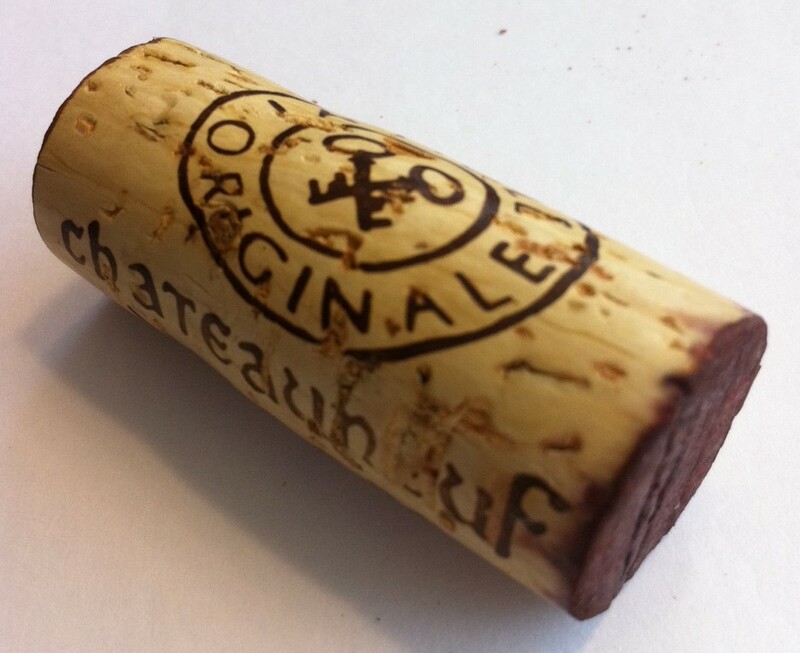 Pleasant wine with a synthetic cork. Turned me right off Peter. It is very light and would be good for drinking on the patio during the summer. Just not something that I have become accustomed to with Cotes du Rhone. Sorry about the spam, Andrew – I have contacted WordPress but they appear hopeless. Shame about Plan Dieu…the trouble with CdR is it’s such a broad category that it comes in all forms! So we are planning a dinner party for Saturday night, all guests like and know their wine. Thought I would serve different wines from the Rhone valley, knowing that they may be quite different, but that is the whole point. So I looked in my repository and found two that looked good, a Crozes Hermitage (2010) and a CNDP Mas de Boislauzon (2010). Reviews on line also looked like they would be good and we would be able to compare Northern to Southern Rhone as one factor in the process. I expect that the CNDP will be superior. However, in my collection I found a bottle of La Fiole du Pape. Was likely given it when hosting a party several years ago. So it has been lying down for about 4 years! realized that it did not have a vintage year – puzzled. So went on line and found your site -long story to get here! You really had a bad experience. My bottle that I opened tonight for no reason at all except I would be wary about opening it for our wine friends because of your critique. So I am now drinking by myself. It is actually quite pleasant, not overly acidic, tannins in the background, reasonable balance, very good ruby colour, not much nose but maybe at my age that could be a problem. It is pleasantly fruity, has a slight astringent aftertaste, but all in all it was quite good. Now the trick will be to remember the experience and relate it to Saturday when I open the Mas de Boislauzon. BTW the second glass was better than the first. I believe that it had to open up somewhat. Thanks for the detailed thoughts – I love hearing about other people’s experiences with the wine. I agree with you that the bottle I had must not have been in ideal shape, and many have said that their experiences have been better than mine was, which I accept. The one thing I would say is that, for a CNDP that clears $40 in some spots in this market, it’s probably fair to expect more than a pleasant-drinking, lower-acid, not overly aromatic, slightly astringent wine (which I think is an excellent description, btw). Still glad yours turned out better than mine and appreciate you taking the time to let me know! I agree with you 100%. I would never purchase La Fiole du Pape. Much better CNDP out there for not much more than one pays for the Fiole. I’ll let you know how the Mas de Boislauzon was.